The application of DNA sequence information for the identification of living organisms (e.g., DNA barcoding) has revolutionized biodiversity science (1,2). Customized, public databases of DNA barcodes have been assembled through concerted efforts such as the International Barcode of Life (iBOL) project. These databases employ standardized gene regions for different groups of organisms. For example, cytochrome c oxidase subunit I (COI) has been established as the standard DNA barcode for animals (1). An increasing number of animal species have been DNA barcoded and their sequences are available publicly through the GenBank and BOLD online data portals (3,4). Similarly, other DNA barcode markers have been established and public libraries built for other kingdoms of life: 16S ribosomal DNA (16S) for bacteria and Archaea (5); 18S ribosomal DNA (18S) for protists (6,7); the nuclear internal transcribed spacer (ITS) for fungi (8); and rbcL and matK gene regions for plants (9). Initial DNA barcoding efforts were based on dideoxy chain-termination (“Sanger”) sequencing (10). While scalable, this approach is limited to producing single DNA barcode sequences for one individual at a time. High-throughput sequencing (HTS) (e.g., Illumina MiSeq) has been established as a viable means of assessing DNA barcode-based biodiversity from individuals (11-13) and mixed tissue samples (14-16). The HTS approach can produce a large number of sequences at a greatly reduced overall cost (11-13,15,17). All of these previous examples of massively parallel recovery of DNA barcode gene(s) have relied upon PCR amplification prior to HTS. Protein-coding genes, such as COI, display more sequence variation between individuals and species as compared to ribosomal markers (18). Hence, they are generally considered more discriminating for the purposes of species identification and biodiversity analysis. However, any oligonucleotide primers designed for amplification of protein-coding gene regions may require the addition of degenerate or inert sites to improve taxonomic coverage. The use of degenerate PCR primer sets can still lead to amplification bias, especially when utilized to amplify environmental mixtures with high sequence diversity. Meanwhile, this bias can be exaggerated by the exponential nature of PCR amplification throughout the PCR cycles. This phenomenon can lead to over-amplification of some DNA templates at the expense of non- or under-amplification of other templates. Another possible effect of PCR amplification is the erroneous recovery of nuclear copies of mitochondrial DNA (i.e., NUMTs or pseudogenes). This amplification, sequencing, and reporting of paralogous gene regions can reach substantial rates in some instances (11,19). It is important to note that primer amplification bias is not due solely to degeneracy and primer mismatch. Primer amplification bias exists even when highly conserved primers are used on mixed tissues. This bias is likely due to differences in GC content of amplicons, amplicon length, annealing temperature, overall genetic diversity of the initial mixture, and the binding energies of the primers themselves (20-22). In order to account for PCR bias, most HTS studies design primers to amplify taxonomic groups of interest. For example, Zeale et al. (23) designed COI primers to amplify 12 orders of insects known to make up the diet of bats prior to amplifying and sequencing bat gut contents. In addition to taxon-specific primer design, the employment of multiple PCR reactions with different primer sets has been shown to lessen the impact of primer bias in HTS research. The multiple primer set approach has been especially effective when attempting to recover sequence data from a broad taxonomic range. In mixtures of arthropod tissue from both freshwater benthos (24) and terrestrial Malaise samples (15), the use of multiple primer sets recovers a greater proportion of taxa present than any single primer set alone. In addition to the possibility of PCR primer bias producing false negative results due to selective exclusion of some species present in a mixture, the issue of organismal abundance has been raised. With the possibility of some DNA templates being selectively amplified over others during the PCR amplification process, relative abundance of DNA sequences cannot be used as a proxy for organismal abundance. Some have attempted to reconcile this discrepancy through the estimation of DNA barcode copy numbers, but this must be calculated one species at a time under controlled lab conditions (25). The necessity of shorter target gene regions suitable for HTS has resulted in a move towards the use of shorter regions of COI contained wholly within the standard COI barcode region (14,15, 26,27). In each case, these shorter gene regions are tested in silico to ensure that the shorter region can still provide adequate species-level discrimination. In contrast, similar tests of species-level discrimination for other potential marker sequence regions (especially non-protein-coding loci) have given mixed results. For example, short segments of the ITS region have proven to be valuable for identification in fungi (28). On the other hand, the nuclear 16S/18S SSU rDNA region has been shown to lump species together producing artificially low reports of biodiversity (29,30). Hybridization capture followed by HTS has been used in previous instances, usually focusing on individual test species. For instance, the capture method has been used to investigate vertebrate/virus genomic integration (31-33), the phylogeography of small sets of vertebrate species (34,35), and ancient plant DNA (36). When used to recover DNA regions associated with human genetic disease, the capture method was able to supply accurate copy number information for multiple gene regions (37). Also using humans as test organisms, capture protocols were used to recover and reassemble complete individual mitochondrial genomes from mixed starting material (38). We propose the use of hybridization capture methods, short DNA barcode regions, and HTS to eliminate the effects of PCR bias on biodiversity assessments of mixed environmental samples. We hypothesize that this approach can improve recovery of DNA barcode data from different types of bulk environmental samples as compared to PCR-based analysis. Hence, a capture-based approach should report fewer taxonomic false negatives as compared to a PCR-based method. Also, relative sequence abundance data should be more detailed and accurate than PCR-based relative sequence abundance data. This hypothesis is tested using capture baits designed from a DNA library representing 26 orders of Arthropoda and the tested tissue samples collected via two, distinct arthropod-targeting sampling methods. Malaise traps typically capture terrestrial insects, whereas benthic sampling using a pond net recovers a broad range of aquatic arthropods. A Malaise sample was collected at Bosque Humedo, Area de Conservación Guanacaste, northwestern Costa Rica (latitude 10.85145°N; longitude −85.60801°W; altitude 290 m; date January 24–31, 2011). The sample was collected directly into 95% ethanol, and frozen at −20°C until thawed and processed. In addition, three benthic samples (A, B, and C) were collected from Wood Buffalo National Park in Alberta, Canada (58.60273°N; 111.52612°W) in June, 2011. The samples were collected 50 meters apart from each other and were taken from the edge of the emergent vegetation zone into the submerged vegetation zone at each site. Samples were collected using a standard pond net with a sterile 400µm mesh net and attached collecting cup attached to a pole. Effort was standardized at 2 minutes per sample. Sampling was conducted by moving the net up and down through the vegetation in a sinusoidal pattern while maintaining constant forward motion. Samples were preserved in 95% ethanol in the field, and kept cold until processed. All DNA-friendly best practices—including wearing clean gloves to collect and handle samples in the field and laboratory and decontaminating nets between samples—were followed to minimize the risk of DNA contamination between sites. For the Malaise sample, all 1,066 morphologically identifiable individuals were isolated, identified to order morphologically, photographed, measured for total body length (excluding antennae) and maximum thoracic width, and tissue subsampled for individual DNA extraction. Dry biomass of each individual was estimated using order-specific length-width formulae (39). The Malaise sample and each of the benthic samples were individually blended in 95% ethanol and the resultant slurry was transferred to multiple sterile 50 mL Falcon tubes. After ethanol evaporation of the slurry at 56°C, the dried mixture was divided into three lysing matrix tubes “A” (about 100 mg each) and homogenized using the MP FastPrep-24 Instrument (MP Biomedicals Inc.) at speed 6 for 40 sec. Total DNA of this homogenized slurry was extracted using the Nucleospin tissue kit (Macherey-Nagel Inc.) following the manufacturer’s instructions and eluted in 50 µL of molecular biology grade water. CTTATRTTRTTTATICGIGGRAAIGC.3` (this paper), A_F: 5`. 5`.CCTARIATIGAIGARAYICCIGC.3` (24); and R5: 5`.GTRATIGCICCIG-CIARIAC.3` (15). The first PCR used COI-specific primers and the second PCR involved Illumina-tailed primers. The PCR reactions were assembled in 25 µL volumes. Each reaction contained 2 µL DNA template, 17.5 µL molecular biology grade water, 2.5 µL 10× reaction buffer (200 mM Tris–HCl, 500 mM KCl, pH 8.4), 1 µL MgCl2 (50 mM), 0.5 µL dNTPs mix (10 mM), 0.5 µL forward primer (10 mM), 0.5 µL reverse primer (10 mM), and 0.5 µL Invitrogen’s Platinum Taq polymerase (5 U/µL). The PCR conditions were initiated with heated lid at 95°C for 5 min., followed by a total of 30 cycles of 94°C for 40 s., 46°C (for both primer sets) for 1 min., and 72°C for 30 s., and a final extension at 72°C for 5 min., and hold at 4°C. Amplicons from each sample were purified using Qiagen’s MiniElute PCR purification columns and eluted in 30 µL molecular biology grade water. The purified amplicons from the first PCR were used as templates in the second PCR with the same amplification condition used in the first PCR with the exception of using Illumina-tailed primers in a 15-cycle amplification regime. All PCRs were done using Eppendorf Mastercycler ep gradient S thermal cyclers and negative control reactions (no DNA template) were included in all experiments. PCR products were visualized on a 1.5% agarose gel to check the amplification success. The most important factor in designing a successful Sequence Capture Developer experiment is the quality of the input sequence used to select the target and capture probes. Conservative, hypervariable regions and copy number variation can introduce problems at the design stage (31,35). These problems increase significantly when creating designs for multiple species where some of the taxa are less represented in the database. In this study, a total of 79,215 COI DNA barcodes (47,631,471 bp) representing 26 arthropod orders, 559 families, and 4,035 genera were downloaded from both GenBank and BOLD in October, 2012. The 98% similarity clustering of the downloaded sequences resulted in 46,762 unique clusters (28,365,304 bp) (Supplementary Table S1). Sequence Capture Developer probes were designed with the help of the NimbleGen probes design team. A total of 2.1 million 50-105 mer probes (baits) were designed to cover all target clusters. Uniformity of probe abundance was considered, especially for highly conservative regions. The baits design covers 26,918,673 target bases (94.9%) from 46,762 (100%) of the clusters. Four Sequence Capture Developer probes reactions were ordered from NimbleGen, catalog number 06740278001. For each of the Malaise and benthic samples, a total of 3 µg total DNA of each sample was sheared using a Covaris S220 Focused ultra-sonicator, resulting in a range of 300-800 bp fragments of each sample. The fragmentation efficiency was tested by running the fragmented DNA on an Agilent Bioanalyzer and DNA 1000 chip. Duplicate libraries with unique indexes were prepared with KAPA LTP library preparation kit (Catalog no. KK8230) according to the manufacturer’s protocol. For the three benthic samples, the indexed libraries were quantified and equimolar concentrations of each were pooled before hybridization. According to the NimbleGen SeqCap EZ SR user guide v4.2, the pooled and un-pooled indexed libraries were blocked with a blend of COT DNA (Sigma Aldrich, catalog number: 05480647001), MB-grade fish sperm DNA (Roche Diagnostics, catalog number: 11467140001), and plant capture enhancer as a part of Sequence Capture Developer Reagent (Roche Diagnostics, catalog number: 06684335001) in addition to the universal sequencing adaptors and the used indexes. The blocked indexed libraries were hybridized to aliquots of SeqCap EZ library at 47°C for 72 hours with the thermocycler’s head lid maintained at 57°C. The captured libraries were recovered using Streptavidin Dynabeads and washed twice with 1x stringent wash buffer preheated to 47°C followed by subsequent washes with wash buffer I, II, and III and finally recovered with 50 µL of molecular biology grade water. The captured libraries were amplified, purified, and quantified to be ready for sequencing. The generated amplicons and captured libraries were sequenced in two MiSeq flow cells (one for amplicons and one for captured libraries) using a V3 MiSeq sequencing kit (300 × 2)(FC-131-1002 and MS-102-3001). PCR amplification followed by sequencing produced between 285,680 and 2,559,402 total sequences for each sample (Table 1). Following quality filtering between 144,356 (50.5%) and 2,342,372 (91.5%) high-quality sequences remained for analysis. Of these high-quality sequences, between 135,560 (93.9%) and 2,075,555 (88.6%) sequences were identified as COI sequences (i.e., had at a minimum of 90% similarity to a reference COI sequence in GenBank). Summary of number of DNA sequences produced, filtered, and used via four different samples and two different methods. Hybridization capture followed by sequencing produced between 3,010,292 and 4,444,412 total sequences for each sample (Table 1). Following quality filtering, between 1,700,512 and 3,713,290 (up to 85.73%) high-quality sequences per sample remained for analysis. Of these sequences, between 1,001,123 and 2,278,390 (up to 68.2%) sequences per sample were identified as COI sequences as mentioned before. For the benthic samples, hybridization capture followed by HTS recovered an average of 18 more orders than PCR amplification followed by HTS. For the Malaise sample, the average increase in order richness was 7. For the benthic samples, hybridization capture followed by HTS recovered an average of 31.8 more families than PCR amplification followed by HTS. For the Malaise sample, the average increase in family richness was 23. For the benthic samples, hybridization capture followed by HTS recovered an average of 37.2 more genera than PCR amplification followed by HTS. For the Malaise sample, the average increase in genus richness was 19.5. Differences in taxonomic recovery considering only arthropod orders—for which the sampling and capture baits were designed—were also calculated. For the benthic samples, hybridization capture followed by HTS recovered an average of 4.7 more arthropod orders than PCR amplification followed by HTS (Figure 1). For the Malaise sample, the average increase in order richness was 6. For the benthic samples, hybridization capture followed by HTS recovered an average of 15 more arthropod families than PCR amplification followed by HTS. 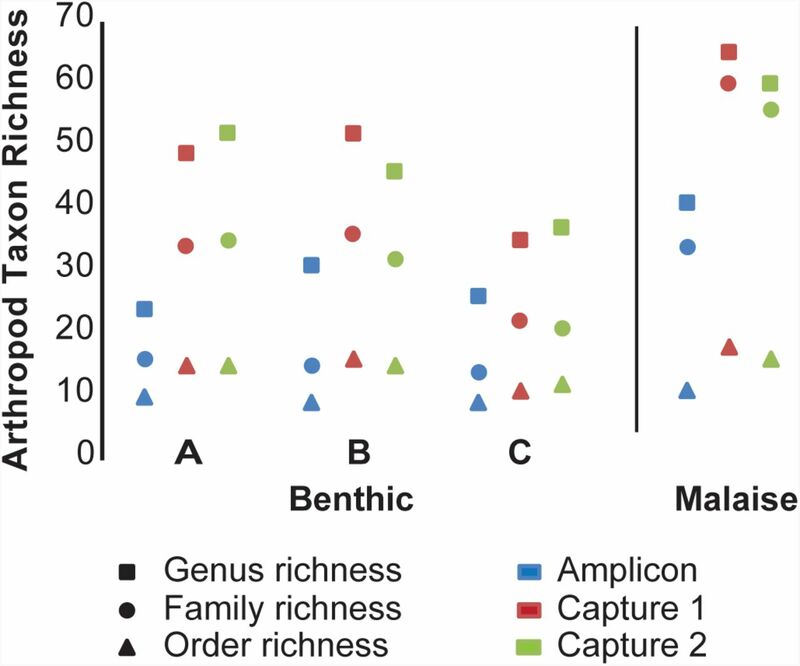 For the Malaise sample, the average increase in arthropod family richness was 24. For the benthic samples, hybridization capture followed by HTS recovered an average of 18.2 more arthropod genera than PCR amplification followed by HTS. For the Malaise sample, the average increase in arthropod genus richness was 21.5. Taxonomic richness recovery at three levels for four different subsamples using PCR amplification and hybridization capture. For the Malaise sample, the four most abundant orders (Diptera, Lepidoptera, Coleoptera, and Hymenoptera) were all arthropods and comprised 94.0% of the biomass of the sample (Supplementary Table S2). These same four orders comprised 95.5%, 97.5%, and 97.4% of the COI sequences recovered by PCR amplification, Capture 1, and Capture 2, respectively. Three arthropod orders (Blattodea, Trombidiformes, and Psocoptera) were detected by morphological identification and biomass analysis, but not by any molecular method. Also, Coleoptera was present as a much higher proportion of biomass (35.6%), than as sequence proportion by any of the three methods (amplification 0.08%; capture 0.23% and 0.29%). Hybridization capture recovered three arthropod orders (Collembola, Neuroptera, Trichoptera) that were detected by biomass analysis, but not by PCR amplification. Furthermore, hybridization capture detected two insect orders (Mantodea, Plecoptera), in very low sequence numbers, which were not detected by either biomass analysis or PCR amplification (Supplementary Table S2). For the Benthic A sample, at the order level, the three most abundant arthropod orders (Diptera, Hemiptera, Podocopida) combined represented 56.0%, 56.4%, and 59.3% of the COI sequences recovered for PCR amplification, Capture 1, and Capture 2, respectively. For the Benthic B sample, at the order level, the mentioned three most abundant arthropod orders combined represented 60.8%, 56.2%, and 55.0% of the COI sequences recovered for PCR amplification, Capture 1, and Capture 2, respectively. 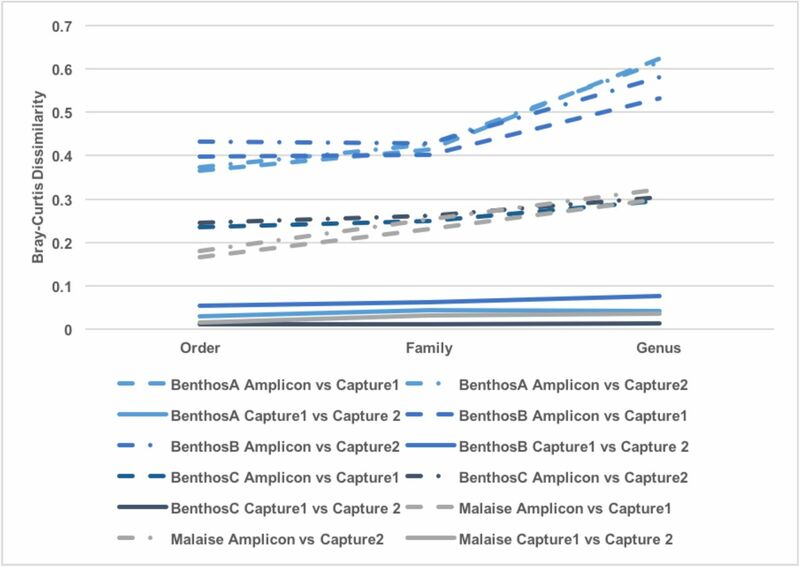 For the Benthic C sample, at the order level, the three most abundant arthropod orders combined composed 93.3%, 92.7%, and 92.9% of the COI sequences recovered for PCR amplification, Capture 1, and Capture 2, respectively (Figure 2). Proportion of DNA sequences identified to order for four different subsamples using PCR amplification and hybridization capture. Amp – sequences recovered via PCR amplification. 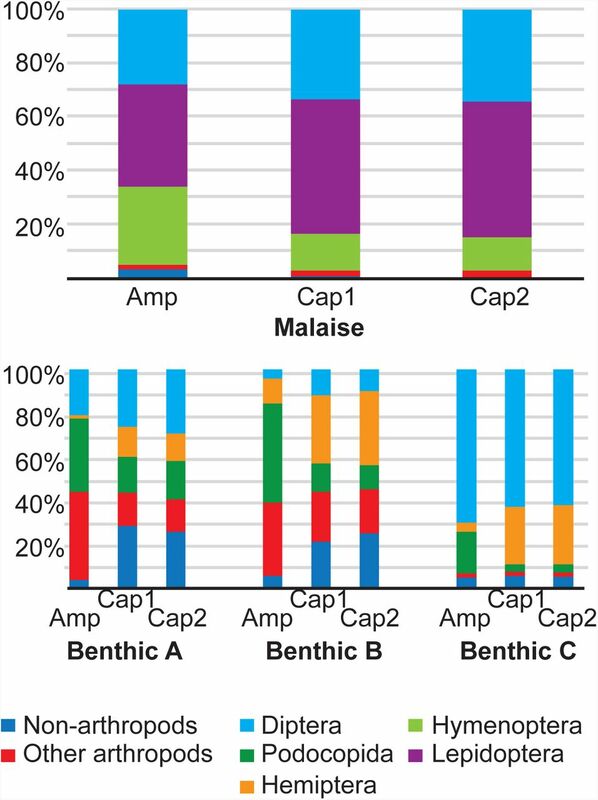 Cap1, Cap2 - sequences recovered via hybridization capture in the first and second attempts. A comparison between methods of the proportion of sequences assigned to each arthropod order, family, and genus was used to generate scatter plots and correlation values (Figure 3). Regardless of sample or taxonomic level, the two rounds of hybridization capture produced highly correlated (0.99 to 1.00) proportions assigned to each taxon. The degree of correlation between PCR amplification and hybridization capture varied (0.43 to 0.93), but was consistently below that of hybridization capture round one versus round two. Similarly, Bray-Curtis dissimilarity values calculated from the proportion by taxon matrices at the arthropod order, family, and genus level were calculated (Figure 4). Likewise, dissimilarity values were much lower for hybridization capture round one versus round two comparisons (0.011 to 0.077), than those for PCR amplification versus hybridization capture comparisons (0.166 to 0.615). 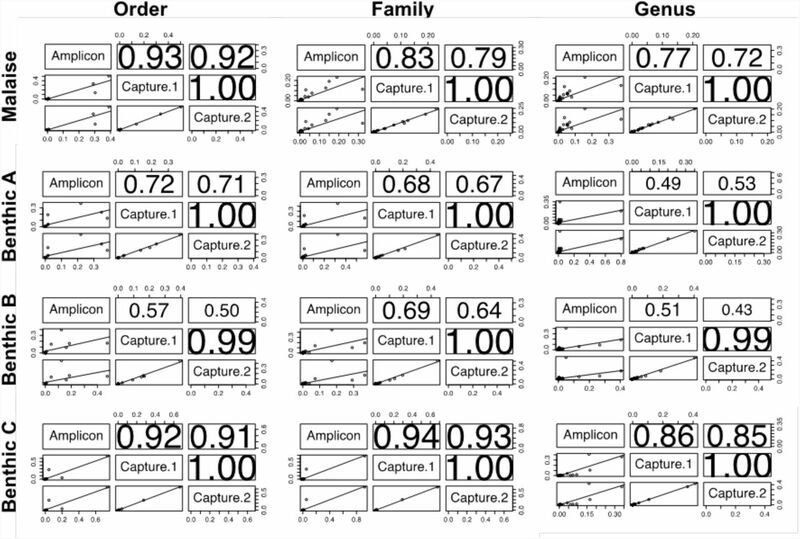 Scatter plots and correlation values of proportion of sequences assigned to each arthropod order, family, and genus for four different subsamples using PCR amplification and hybridization capture. Bray-Curtis dissimilarity values based on proportion of sequences assigned to each arthropod order, family, and genus for four different subsamples using PCR amplification and hybridization capture. This study is the first targeted attempt at PCR-free DNA barcode recovery from mixed environmental samples. Previous work employed mitochondrial enrichment followed by sequencing of total enriched mtDNA (45). This method required the exclusion of 99.5% of sequence data in order to retain only the 0.5% that comprises informative COI DNA barcode data. Liu et al. (46) were able to increase the efficiency of whole mitochondrial genome sequencing to about 42.5% by using a capture microarray followed by HTS in a mock community sample containing equal aliquots of genomic DNA extracts of 49 species. The present method retains 52.4 to 68.2% of the passed filter sequences produced through Illumina MiSeq sequencing for final analysis (Table 1). Whether pooled as three lower diversity samples or retained as one single, high diversity, high sequencing coverage sample, this produces one to two million COI sequences per sample for further analysis. This rate of analyzable sequences does not differ between benthic- and Malaise-derived tissue samples. The recovery of non-target DNA regions has been noted in previous use of capture enrichment in resequencing studies where multiple regions of the genome need to be enriched and analyzed (33,34,37). This occurrence is likely due to the capture of adjacent (“flanking”) DNA regions during the hybridization process. The proportion of recovered sequences not matching targets ranges between 18 and 42% in these previous studies. In the present study, 31.8 to 47.6% of high-quality sequences produced through hybridization capture recovered were not positively identified as COI. This rate in target recovery, while similar to previous resequencing studies, differs fundamentally from past mitochondrial enrichment experiments. Previously, hybridization baits were designed and implemented to target a number of different gene regions for a narrow range of organisms (e.g., the entire mitochondrial genome of one species). The present use of hybridization capture targets many versions of one small gene region in order to retain sequence data from a taxonomically wide range of organisms. As such, the rate of non-target sequence generation can be interpreted as either capture of non-COI sequences with some affinity for the oligonucleotide baits used, or else sequencing error within the Illumina MiSeq resulting in uninformative sequences. Any truly “flanking” sequences adjacent to the COI region targeted could still be retained and identified as COI sequences. Hybridization capture followed by HTS recovered approximately twice as many order, family, and genus names as compared to PCR amplification for the three benthic samples (Table 1, Figure 1). Likewise, hybridization capture followed by HTS recovered an increase in order, family, and genus richness for the Malaise sample. These increases in taxonomic recovery are more pronounced when only the Arthropoda are considered. These increases in biodiversity detection reflect a reduced false negative rate due to the absence of primer amplification bias. The difference in increased taxonomic recovery at each level reveals an important difference between the benthic and Malaise samples. For both Malaise and benthic samples, the majority of the orders recovered only through hybridization capture were non-insects, including other arthropods, vertebrates, diatoms, fungi, and plants. Benthic samples, being aquatic in nature, will include a number of orders not found in a terrestrial sample, especially zooplankton and phytoplankton. To rule out false positives, we considered only the sequencing clusters containing more than ten sequences per cluster. The PCR amplification primers employed were designed for insects and are unlikely to have amplified non-insect orders. The hybridization capture, despite also being designed from insect DNA sequences, employs multiple longer oligos complementary to multiple fragments of the COI gene region and was better able to recover non-insect taxa. It has been stated that PCR primer bias is likely to make conventional barcode copy abundance calculations from HTS environmental DNA studies impossible (e.g., 47). The removal of this bias facilitates a shift towards more meaningful interpretations of sequence numbers recovered from environmental samples and decreases chances of false negatives for taxa with a small biomass or rare taxa (15,17). For all benthic and Malaise samples, there was consistency in relative sequence frequencies between hybridization capture attempts at the arthropod genus, family, and order levels (Figure 2, Table 2). In all samples, PCR amplification recovered a different community profile from hybridization capture (Figures 2, 3; Table 1). In the Malaise sample, when compared to biomass calculations, the difference in proportion of sequences assigned to each taxon is noticed as an overabundance of Lepidoptera sequences at the expense of Coleoptera. In addition, three orders (Blattodea, Trombidiformes, and Psocoptera) are not detected by HTS methods at all. This result is likely a product of the taxonomic composition of GenBank COI libraries. An abundance of tropical Lepidoptera are represented as GenBank records whereas few Costa Rican Blattodea, Psocoptera, and Trombidiformes are included. This lack of likely matches, coupled with our strict 98% similarity cut-off, resulted in a failure to recover these orders. As a further analysis, when similarity cut-offs were loosened to 90% similarity, with the same GenBank library, Blattodea, Trombidiformes, and Psocoptera were recovered with HTS methods, and Coleoptera was recovered as a much greater proportion of sequences (results not shown). However, a relaxed cut-off for sequence analyses such as BLAST could also result in reduced confidence in taxonomic identification of sequences or may result in false positives. As reference DNA barcode libraries are populated with diverse taxa and include better representation of local populations (haplotypes), sequence capture studies can benefit from these additional sequences both for the design of capture probes and in subsequent analyses of sequences. In fact, the use of standard DNA markers (e.g., barcodes) and provisioning reference databases with voucher specimens could facilitate large-scale analyses of environmental samples. The use of HTS to allow parallel sequencing of multiple genetic markers in both library building and environmental mixture research has been previously proposed and demonstrated (11,12,15). While the present study focused on COI region as the most widely used DNA barcodes, the protocol could be easily adapted to include other DNA barcode regions, phylogenetic markers, or functional genes. The presented approach offers the flexibility to be customized to specific target groups and multiple barcoding markers. It also overcomes the challenges in PCR-based methods including primer design in hypervariable markers and the associated bias. The ability to multiplex many samples and recover individual sample data at sufficient sequencing depth is shown here to have no negative effect on biodiversity data recovery. The push to include as many samples and genetic markers as desired in future HTS-based biodiversity studies would be readily accommodated by the current protocol. This project was funded by the Government of Canada through Genome Canada, Ontario Genomics Institute, and Environment and Climate Change Canada through the Biomonitoring 2.0 project to M.H. and the National Science Foundation [grant number DEB 0515699 to D.H.J]. J.F.G. was also funded by a Natural Sciences and Engineering Research Council of Canada Postdoctoral Fellowship. We are grateful to Area de Conservación Guanacaste for protecting the forest habitat that we sampled. Hebert, P.D.N., Cywinska, A., Ball, S.L. and de Waard, J.R. (2003) Biological identifications through DNA barcodes. Proceedings of the Royal Society B, 270, 313–321. Hajibabaei, M., Singer, G.A., Clare, E.L. and Hebert, P.D.N. (2007) Design and applicability of DNA arrays and DNA barcodes in biodiversity monitoring. BMC Biology, 5, 24. Ratnasingham, S. and Hebert, P.D.N. (2007) BOLD: the barcode of life data system (www.barcodinglife.org). Molecular Ecology Notes, 7, 355–364. Benson, D.A., Karsch-Mizrachi, I., Lipman, D.J., Ostell, J. and Sayers, E.W. (2010) GenBank. Nucleic Acids Research, 39, D32–D37. Tringe, S.G. and Hugenholtz, P. (2008) A renaissance for the pioneering 16S rRNA gene. Current Opinions in Microbiology, 11, 442–446. Creer, S., Fonseca, V.G., Porazinska, D.L., Giblin-Davis, R.M., Sung, W., Power, D.M., Packer, M., Carvalho, G.R., Blaxter, M.L., Lambshead, P.J. et al. (2010) Ultrasequencing of the meiofaunal biosphere: practice, pitfalls and promises. Molecular Ecology, 19 Suppl 1, 4–20. Weber, A.A. and Pawlowski, J. (2013) Can abundance of protists be inferred from sequence data: a case study of foraminifera. PLoS One, 8(2), e56739. Schoch, C.L., Seifert, K.A., Huhndorf, S., Robert, V., Spouge, J.L., Levesque, C.A., Chen, W. and the Fungal Barcoding Consortium (2012) Nuclear ribosomal internal transcribed spacer (ITS) region as a universal DNA barcode marker for Fungi. Proceedings of the National Academy of Science USA, 109, 6241–6246. CBOL Plant Working Group (2009) A DNA barcode for land plants. Proceedings of the National Academy of Science USA, 106, 12794–12797. Sanger, F., Nicklen, S. and Coulson, A.R. (1977) DNA sequencing with chain-terminating inhibitors. Proceedings of the National Academy of Science USA, 74, 5463–5467. Shokralla, S., Gibson, J.F., Nikbakht, H., Janzen, D.H., Hallwachs, W. and Hajibabaei, M. (2014) Next-generation DNA barcoding: using next-generation sequencing to enhance and accelerate DNA barcode capture from single specimens. Molecular Ecology Resources, 14, 892–901. Shokralla, S., Porter, T.M., Gibson, J.F., Dobosz, R., Janzen, D.H., Hallwachs, W., Golding, G.B. and Hajibabaei, M. (2015) Massively parallel multiplex DNA sequencing for specimen identification using an Illumina MiSeq platform. Scientific Reports, 5, 9687. Meier, R., Wong, W., Srivathsan, A. and Foo, M. (2015) $1 DNA barcodes for reconstructing complex phenomes and finding rare species in specimen-rich samples. Cladistics, 32, 100–110. Hajibabaei, M., Shokralla, S., Zhou, X., Singer, G.A.C. and Baird, D.J. (2011) Environmental barcoding: a next-generation sequencing approach for biomonitoring applications using river benthos. PLoS One, 6, e17497. Gibson, J., Shokralla, S., Porter, T.M., King, I., vanKonynenburg, S., Janzen, D.H., Hallwachs, W. and Hajibabaei, M. (2014) Simultaneous assessment of the macrobiome and microbiome in a bulk sample of tropical arthropods through DNA metasystematics. Proceedings of the National Academy of Science USA, 111, 8007–8012. Leray, M. and Knowlton, N. (2015) DNA barcoding and metabarcoding of standardized samples reveal patterns of marine benthic diversity. Proceedings of the National Academy of Science USA, 112, 2076–2081. Shokralla, S., Spall, J.L., Gibson, J.F. and Hajibabaei, M. (2012) Next-generation sequencing technologies for environmental DNA research. Molecular Ecology, 21, 1794–1805. Gibson, J.F., Skevington, J.H. and Kelso, S. (2010) Placement of Conopidae (Diptera) within Schizophora based on mtDNA and nrDNA gene regions. Molecular Phylogenetics and Evolution, 56, 91–103. Haran, J., Koutroumpa, F., Magnoux, E., Roques, A. and Roux, G. (2015) Ghost mtDNA haplotypes generated by fortuitous NUMTs can deeply disturb infra-specific genetic diversity and phylogeographic pattern. Journal of Zoological Systematics and Evolutionary Research, 53, 109–115. Suzuki, M.T. and Giovannoni, S.J. (1996) Bias caused by template annealing in the amplification of mixtures of 16S genes by PCR Applied and Environmental Microbiology, 62, 625–630. Polz, M.F. and Cavanaugh, C.M. (1998) Bias in template-to-product ratios in multitemplate PCR. Applied and Environmental Microbiology, 64, 3724–3730. Gonzalez, J.M., Portillo, M.C., Belda-Ferre, P. and Mira, A. (2012) Amplification by PCR artificially reduces the proportion of the rare biosphere in microbial communities. PLoS One, 7, e29973. Zeale, M.R., Butlin, R.K., Barker, G.L., Lees, D.C. and Jones, G. (2011) Taxon-specific PCR for DNA barcoding arthropod prey in bat faeces. Molecular Ecology Resources, 11, 236–244. Hajibabaei, M., Spall, J.L., Shokralla, S. and vanKonynenburg, S. (2012) Assessing biodiversity of a freshwater benthic macroinvertebrate community through nondestructive environmental barcoding of DNA from preservative ethanol. BMC Ecology, 12, 28. Darby, B.J., Todd, T.C. and Herman, M.A. (2013) High-throughput amplicon sequencing of rRNA genes requires a copy number correction to accurately reflect the effects of management practices on soil nematode community structure. Molecular Ecology, 22, 5456–5471. Meusnier, I., Singer, G.A.C., Landry, J.-F., Hickey, D.A., Hebert, P.D.N. and Hajibabaei, M. (2008) A universal DNA mini-barcode for biodiversity analysis. BMC Genomics, 9, 214. Shokralla, S., Hellberg, R.S., Handy, S.M., King, I. and Hajibabaei, M. (2015) A DNA mini-barcoding system for authentication of processes fish products. Scientific Reports, 5, 15894. Porter, T.M. and Golding, G.B. (2011) Are similarity- or phylogeny-based methods more appropriate for classifying internal transcribed spacer (ITS) metagenomic amplicons? New Phytologist, 192, 775–782. Tang, C.Q., Leasi, F., Obertegger, U., Kieneke, A., Barraclough, T.G. and Fontaneto, D. (2012) The widely used small subunit 18S rDNA molecule greatly underestimates true diversity in biodiversity surveys of the meiofauna. Proceedings of the National Academy of Science USA, 109, 16208–16212. Zhan, A., Bailey, S.A., Heath, D.D. and MacIsaac, H.J. (2014) Performance comparison of genetic markers for high-throughput sequencing-based biodiversity assessment in complex communities. Molecular Ecology Resources, 14, 1049–1059. Duncavage, E.J., Magrini, V., Becker, N., Armstrong, J.R., Demeter, R.T., Wylie, T., Abel, H.J. and Pfeifer, J.D. (2011) Hybrid capture and next-generation sequencing identify viral integration sites from formalin-fixed, paraffin-embedded tissue. The Journal of Molecular Diagnostics, 13, 325–333. Tsangaras, K., Siracusa, M.C., Nikolaidis, N., Ishida, Y., Cui, P., Vielgrader, H., Helgen, K.M., Roca, A.L. and Greenwood, A.D. (2014) Hybridization capture reveals evolution and conservation across the entire Koala retrovirus genome. PLoS One, 9, e95633. Tsangaras, K., Wales, N., Sicheritz-Pontén, T., Rasmussen, S., Michaux, J., Ishida, Y., Morand, S., Kampmann, M.-L., Gilbert, M.T.P. and Greenwood, A.D. (2014) Hybridization capture using short PCR products enriches small genomes by capturing flanking sequences (CapFlank). PLoS One, 9, e109101. Mason, V.C., Li, G., Helgen, K.M. and Murphy, W.J. (2011) Efficient cross-species capture hybridization and next-generation sequencing of mitochondrial genomes from noninvasively sampled museum specimens. Genome Research, 21, 1695–1704. Peñalba, J.V., Smith, L.L., Tonione, M.A., Sass, C., Hykin, S.M., Skipwith, P.L., McGuire, J.A., Bowie, R.C.K. and Moritz, C. (2014) Sequence capture using PCR-generated probes: a cost-effective method of targeted high-throughput sequencing for nonmodel organisms. Molecular Ecology Resources, 14, 1000–1010. Ávila-Arcos, M.C., Cappellini, E., Romero-Navarro, J.A., Wales, N., Moreno-Mayar, J.V., Rasmussen, M., Fordyce, S.L., Montiel, R., Vielle-Calzada, J.-P., Willerslev, E. et al. (2011) Application and comparison of large-scale solution-based DNA capture-enrichment methods on ancient DNA. Scientific Reports, 1, 74. Herman, D.S., Hovingh, G.K., Iartchouk, O., Rehm, H.L., Kucherlapati, R., Seidman, J.G. and Siedman, C.E. (2009) Filter-based hybridization capture of subgenomes enables resequencing and copy-number detection. Nature Methods, 6, 507–510. Maricic, T., Whitten, M. and Pääbo, S. (2010) Multiplexed DNA sequence capture of mitochondrial genomes using PCR products. PLoS One, 5, e14004. Gruner, D.S. (2003) Regressions of length and width to predict arthropod biomass in the Hawaiian Islands. Pacific Science, 57, 325–336. Folmer, O., Black, M., Hoeh, W., Lutz, R. and Vrijenhoek, R. (1994) DNA primers for amplification of mitochondrial cytochrome c oxidase subunit I from diverse metazoan invertebrates. Molecular Marine Biology and Biotechnology, 3, 294–299. Schmieder, R. and Edwards, R. (2011) Quality control and preprocessing of metagenomic datasets. Bioinformatics, 27, 863–864. Edgar, R.C. (2010) Search and clustering orders of magnitude faster than BLAST. Bioinformatics, 26, 2460–2461. Edgar, R.C., Haas, B.J., Clemente, J.C., Quince, C. and Knight, R. (2011) UCHIME improves sensitivity and speed of chimera detection. Bioinformatics, 27, 2194–2200. Zhang, Z., Schwartz, S., Wagner, L. and Miller, W. (2000) A greedy algorithm for aligning DNA sequences. Journal of Computational Biology, 7, 203–214. Zhou, X., Li, Y., Liu, S., Yang, Q., Su, X., Zhou, L., Tang, M., Fu, R., Li, J. & Huang, Q. (2013) Ultra-deep sequencing enables high-fidelity recovery of biodiversity for bulk arthropod samples without PCR amplification. GigaScience, 2, 4. Liu S., Wang X., Xie L., Tan M., Li Z., Zhang H., Misof B., Kjer KM., Tang M., Niehuis O., Jiang H., and Zhou X. (2016) Mitochondrial capture enriches mito-DNA 100 fold, enabling PCR-free mitogenomics biodiversity analysis. Molecular Ecology Resources, 16, 470–479. Piñol, J., Mir, G., Gomez-Polo, P. & Agustí, N. (2014) Universal and blocking primer mismatches limit the use of high-throughput DNA sequencing for the quantitative metabarcoding of arthropods. Molecular Ecology Resources, 15, 819–830.